I’ve got my fingers crossed that Money Trees work. I’ve added one to my office to increase my prosperity feng shui. It stands about 4½-5′ tall and has a braided trunk. Pretty! I put some SuperThrive on it (a plant hormone recommended by dirtynailz at DiggingRI) and it’s doing really really well, putting out new sprouts and growing about a foot in the few months I’ve had it. I should probably trim it…but I’m a little superstitious about pruning my money tree, you know? 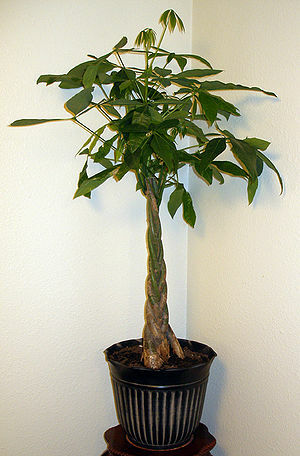 Money trees (Pachira aquatica) like low lighting and prefer to dry out between waterings. Since they like low lighting, they are well-suited to any room in the house that isn’t heavy on the sunshine. They have a broad five-leaf umbrella at the end of each branch or stem. You can also find them as bonsai, but the tall braided-stem type is definitely impressive. In their native habitat, Pachira aquatica flowers and produces nuts, growing up to 10 or 20 feet tall. The featured photo up top shows its magnificent flower. Because of its lucky association with money, it seems fitting that this plant be assigned to Taurus. While the Sun is in Taurus, I encourage everyone to start a little savings fund to make a special purchase for your garden. Maybe a new bench or bird feeder or that special plant you’ve always wanted, but couldn’t quite afford. Here in Georgia pulp wood country, there’s a saying about money trees that’s a bit different from the money trees most of us are familiar with. “That right there is your money tree.” The first time I heard the expression, my friend Malcolm pointed out a gorgeous, stately pine in our backyard. This King of our backyard stands regally, holding court among its smaller neighbors. It was Malcolm’s way of saying that the tree is tall, thick in circumference, straight, and could put a nice amount of cash in our pockets. It’s definitely our money tree, but we’ll never cut it for cash. 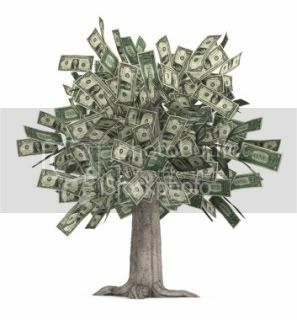 Now if only I could walk into my office and find my feng shui money tree in flower like this one. CJ did you also know that if your tree puts out a 7-leaf cluster it’s extra extra lucky? I’ve had mine for years now, and I have had several 7-leafed clusters, although the usual number is 6. I have mine in a northeast facing window in my kitchen and it seems happy there. Right now it’s pushing out new growth and I’m counting those little leaves! Mine could be happier, dn. I have it in a corner now with a plant light on it and it seems to be okay, but it could be doing better, I think. I’ll be counting leaves very soon.